I wish this book was written differently. It is quite easy going for the first 40 pages but eventually it gets really thick and confusing. This is because the author cuts and pastes extracts from letters and books.I see why he did it. He wanted to present the conquest of Mexico from both sides, the Victors and the Vanquished.I think the trouble with this book is that it's not suited to my reading preferences. When such cut-and-paste stuff occurs in books there are so many different voices and styles talking one after the other that it's hard to keep it all straight. The fact that these are excerpts often taken out of their full context doesn't help as well. This is why I'm abandoning this book.However, if you're a history buff, you will probably appreciate the first hand accounts from the people who were there. 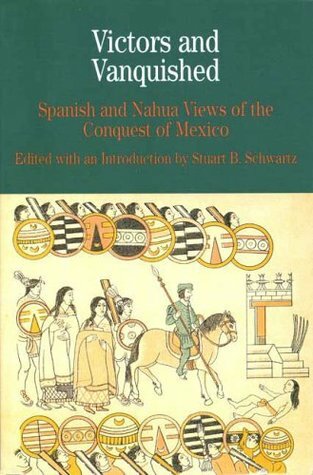 After reading Stuart B. Schwartz’s book, “Victors and Vanquished: Spanish and Nahua Views of the Conquest of Mexico” one must conclude that if one must choose a correct perspective, either Spanish or Nahua, it cannot be done definitively for there are flaws with both sides. The most accurate account of events seems to have been given by Bernal Diaz because he, unlike the Nahua or Cortez, had no reason to sway or impress either the Spanish throne or the Catholic church. Regardless of right or wrong, the debate over fact from fiction will continue to revive the subject for debate, doing honor to history by inspiring people to dig deeper for answers. Uses large chunks of other books rather than referencing them. Granted it is written to be more of a college course textbook, that's fine. It allows for side by side comparison without having both sources side by side. If you've already read the other sources this will not be worth your time unless you want to glance through it. The intros to each chapter have more new information that the chapters themselves. Interesting new translation to Bernal Diaz del Castillo's True History of the Conquest of New Spain with idiot proof editing.The sections after the fall and seizure of Tenochtitlan are the most informative as to new sources that aren't repetitive. I read this book for a history course I am enrolled in. I have little background knowledge of the Spanish Conquest of Mexico and after having read the book I don't feel any more knowledgeable. The book was frustrating to read in that the passages tend to drone on and I'll read a few pages and then can't remember what I just read. Although interesting, I wish I had been able to get a lot more out of the book. I just finished reading this book last week for my history class. The information that is found in this book is extremely interesting (first hand accounts really give it a nearly chilling quality at times! ), but the way it was written left me confused off and on throughout the entire book. Had this been compiled differently, it certainly would've been a historical gem. The analyses of primary sources could have been written with a bit more character and liveliness. The sources themselves were very interesting and informative, but I can't help but feel that reading that ACTUAL sources would be a better way to get at them. Very good for teaching primary sources and the Spanish conquest of Mexico to undergrads. Stuart B. Schwartz - Stuart B. Schwartz is Professor of History at Yale University and the former Master of Ezra Stiles College.He studied at Middlebury College, where he received his undergraduate degree, and the Universidad Autonoma de Mexico. He then went on to study Latin American History at Columbia University where he received his Ph.D. (1968).He is one of the leading specialists on the History of colonial Latin America, especially Brazil and on the history of Early Modern expansion.